Feeding line: the standard hose connector fits to hoses with 10 mm ID. You can choose several hose connectors with other dimensions ranging from 8 - 12 mm. You can find those parts in the subcategory "Additional tank/connections". Return line: the standard hose connector fits to hoses with 19 mm ID. You can choose several hose connectors with other dimensions ranging from 6-12 mm ID or a blind plug to seal this thread in the subcategory "Additional tank/connections". Ventilation: we offer several ventilation sets consisting of ventilation hose connectors and the respective hoses. Fuel sender/fuel gauge: exclusively produced by Monopoel we deliver a universal fuel sender suitable for all fixed tanks as well as for 12 V and 24 V vehicles (tank-geber-uni). 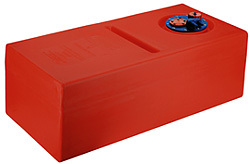 The respective fuel gauge are available as 12 V/24 V type (tank-uhr-uni). The fuel sender unit is easy to assembly as you have to replace the blind cover plate on top of the tank by the fuel sender. * The measures of the tank are those of the body of the tank, at the connection plate/filler cap you have to add 35 mm height. How can I assembly the connections ? See "datasheet/info" below. How do i mount a fuel tank ?